Citation Information: J Clin Invest. 2018;128(7):2713-2723. https://doi.org/10.1172/JCI97950. Non-resolving inflammation drives the development of clinically dangerous atherosclerotic lesions by promoting sustained plaque inflammation, large necrotic cores, thin fibrous caps, and thrombosis. Resolution of inflammation is not merely a passive return to homeostasis, but rather an active process mediated by specific molecules, including fatty acid–derived specialized pro-resolving mediators (SPMs). 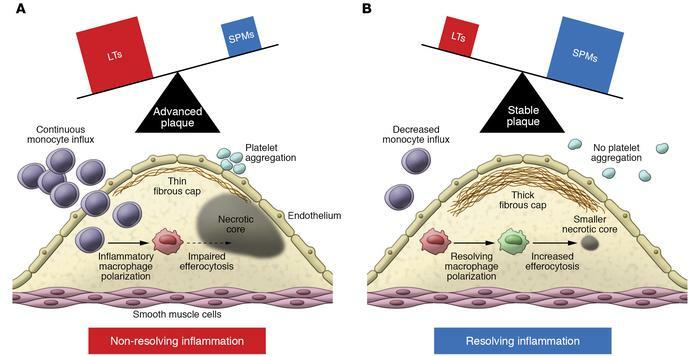 In advanced atherosclerosis, there is an imbalance between levels of SPMs and proinflammatory lipid mediators, which results in sustained leukocyte influx into lesions, inflammatory macrophage polarization, and impaired efferocytosis. In animal models of advanced atherosclerosis, restoration of SPMs limits plaque progression by suppressing inflammation, enhancing efferocytosis, and promoting an increase in collagen cap thickness. This Review discusses the roles of non-resolving inflammation in atherosclerosis and highlights the unique therapeutic potential of SPMs in blocking the progression of clinically dangerous plaques. Imbalance of SPMs and leukotrienes (LTs) promotes instability of atherosclerotic plaques. When the SPM/LT ratio is low (A), resolution of inflammation is impaired, leading to sustained inflammatory Ly6chi monocyte influx, platelet aggregation, proinflammatory macrophage polarization, impaired efferocytosis, large necrotic cores, and thin fibrous caps. Conversely, an increase in the SPM/LT ratio (B) promotes resolution, characterized by attenuated Ly6hi monocyte influx, pro-resolving macrophage polarization, enhanced efferocytosis, decreased necrotic core formation, and thicker fibrous caps.